Cat Haven is the perfect place to find your new feline companion. Whether it's a crazy kitten or a sedate lap cat, we have one (or two) to suit your lifestyle. With great value for money adoption packages, why look anywhere else? All our cats and kittens are sterilised, microchipped and vaccinated, wormed and treated for fleas. We also offer boarding facilities, cat retail store and online, ranger service, volunteering and cat fostering opportunities and subsidised cat sterilisation for concession card holders. Open 7 days per week, Closed Christmas Day and Good Friday. See our website for opening hours. 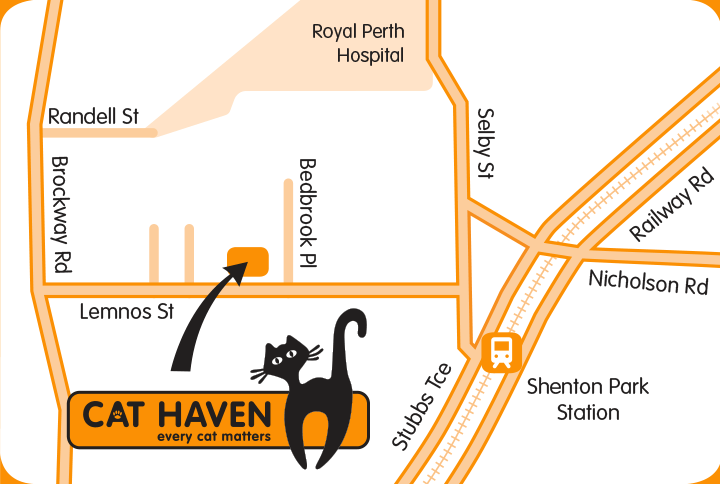 Cat Haven is the largest stray and lost cat shelter in WA, taking in up to 8500 cats a year. As a licensed charity with very little Government funding, we desperately need donations to keep our commitment to rescuing and rehoming the stray cats of Perth. Please donate, adopt, foster, volunteer or gift Cat Haven in your Will.